The Genie Runabout is a compact, low weight machine that features zero inside turning radius, and non marking solid rubber tyres. The runabout can be used on gradients is also drivable when fully elevated. 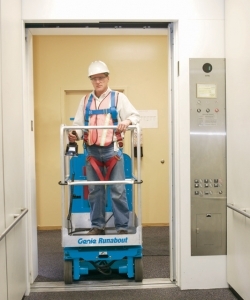 Platform controls are equipped with on board diagnostics and proportional lift and drive controls provide a smooth ride. Ultra narrow dimensions of between 75cm to 80 cm width and 1.35m length allow the Runabout to fit into most passenger lifts or be driven through a standard doorway with the operator on board. For internal use only. 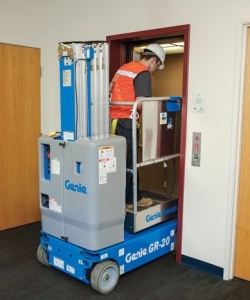 The Genie Runabout Contractor (GRC) is suitable for use on construction sites, and has a tube-in-tube telescoping mast and a steel platform for durability in rougher environments. View NEW machines below, or click HERE to see our used machines. Working / drive height 5.45m, load capacity 227Kg, width 75cm. 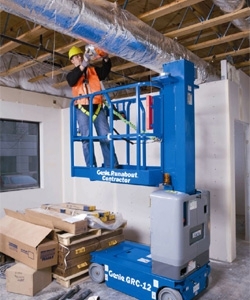 Optional extending platform which gives the operator up to 0.51m of horizontal reach. Increased working / drive height of 6.52m, load capacity 227Kg, width 75cm. Optional extending platform for additional horizontal reach. Working / drive height 8.02m, load capacity 159Kg, width 80cm. 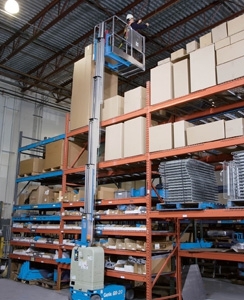 Optional extending platform for greater horizontal reach. Internal use only. Compact machine for 2 people, ideal for construction applications such as painting, decorating, renovations and electrical contractors. Indoor use only.